Timeline is an online tool that allows users to create their own timeline or schedule with relative ease. It allows students to clearly demonstrate what they have learned about the subject matter and presents the material in an easy-to-follow, chronological manner that really ensures that the students understand what they have studied. Timeline requires no registration or log in, so the user is not forced to forfeit any personal information in order to use the application, which is ideal for many. However, it is not great in terms of accessibility. For example users with visual impairments would have a very difficult time operating the tool in terms of selecting their desired preferences and denoting which parts of the timeline they want to add to. Other than this drawback, the overall ease of use is commendable. It is extremely basic and to the point, and doesn’t have any extra bells and whistles in terms of customization. This could be seen as a disadvantage, but when used in the classroom, it will encourage students to focus on the actual content rather than spending too much time on making it visually appealing. This focus on content really emphasizes Timeline’s effective use as a knowledge-centered tool. Substitution: Students use the tool to create a virtual timeline chronologically displaying a historical time period, geographical development, stages of organism growth, or the important events in a literary work rather than doing the same simply on paper. Augmentation: Students provide feedback directly via email to every other student’s timeline over the next few days. Modification: There is another period, perhaps another three days, where students respond to one another’s feedback and make changes to their projects. Redefinition: Teachers of the course provide their feedback on the material and timelines as well as creating a master timeline with the help of the student’s by combining material from each timeline. 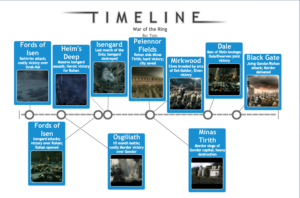 Example of a timeline depicting the major battles of the War of the Ring, from The Lord of the Rings, chronologically. Enter the name you wish the timeline to appear under and the name of your project. To add to the timeline, simply click the place on the line that you wish to add an event to. Create a header label such as a specific date or major event and a short description if you want to. You also have the option of uploading an image to go with it. You can drag the text box and point on the timeline to wherever you want it. Repeat steps 4 and 5 for as many items as you would like your timeline to have. Once you are done, hit “Finish”. You can look over your finished project and save it if you wish. You also have the option to print or email the project.